First, a disclaimer: this is not “authentic” Jambalaya. Like a lot of the things I cook, it’s a bastardized version of a classic. Adding to the usual bastardization, I made this our first week in Oxford, before I knew where to find things in the stores and before I had a cooking pot. However, I was desperate for some American fare, so I made it in the wok the college gave us and had to make a few substitutions. Oxford has since turned out to have a pretty amazing grocery selection – more on that in another post. 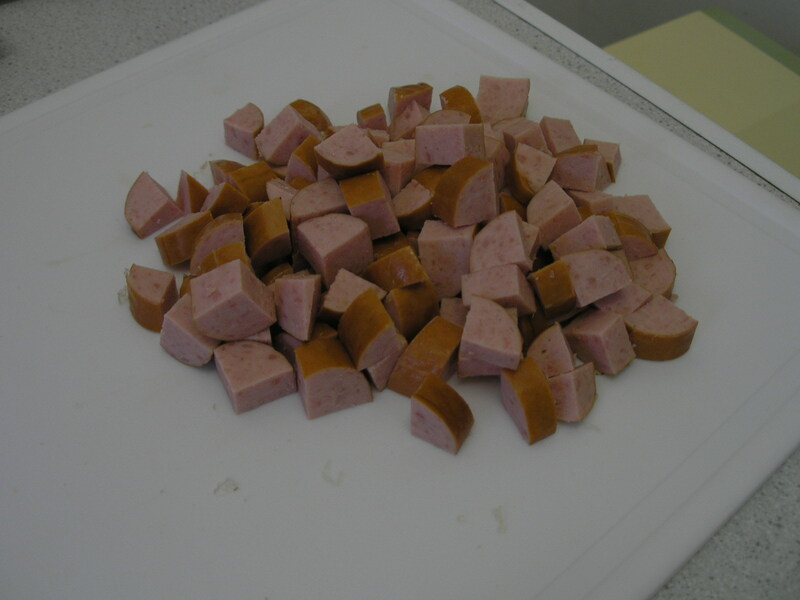 First things first, cut up 12 oz of Andouille sausage. You can also use chorizo. Herbivores can use soyrizo (the only fake meat fit for consumption) or throw in some extra spices and use another can of beans. Of course, then you’re just making red beans and rice. I digress. Sadly, this is not Andouille or chorizo, it’s regular smoked pork sausage with a handful of chili powder and cumin thrown in. Next, take a gratuitous photo of 2 tablespoons of butter melting. Fry your sausage until it gets a little brown around the edges. Meanwhile chop up an onion, a green bell pepper and 2 stalks of celery. Obligatory blog mention: this is called “the holy trinity” in Cajun cooking. Also, one clove of garlic, minced. Set the sausage aside and cook the veggies in the leftover butter and grease. 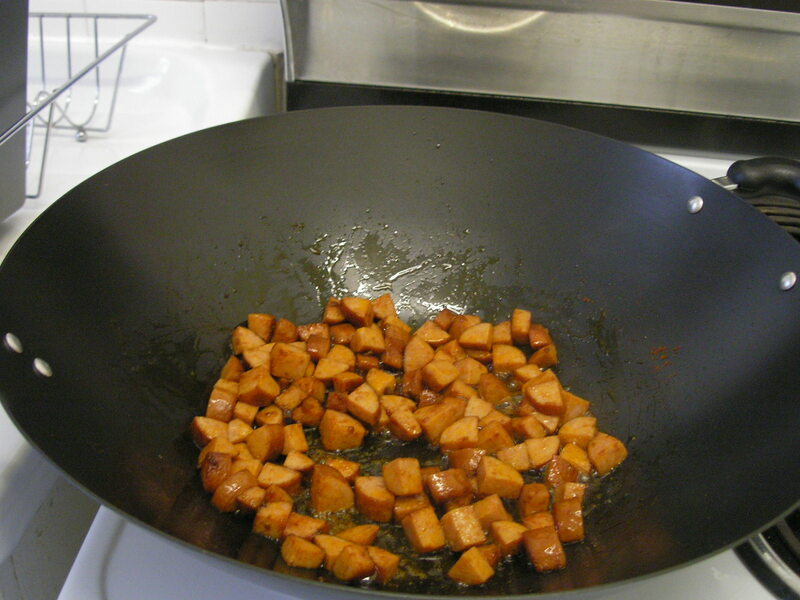 You can also use the veggie juices to de-glaze the pan a bit. Just scrape the bottom as you saute. Once the veggies are soft, add a cup of rice, 2 T of tomato paste and some red pepper/chili powder. Stir for about a minute. Throw the sausage back in, add a can of diced tomatoes, 2 cups of boiling water, salt pepper and thyme. Let it cook for 12-15 minutes or until the rice is done. Once the rice is done, add a drained can or 2 cups of cooked beans. If you have a little extra liquid, it will evaporate at this stage. I ended up with kidney beans, after failing to find black-eyed peas at the store, but you can use whatever beans you like. Continue cooking until the beans are hot and absorb some of the flavors, 5-10 minutes. Eat it with a homemade biscuit. (A real biscuit, not a cookie.) Or wait; this is even better the next day. Takes an hour, including prep time. Serves 6. 1. Melt the butter over medium heat in a large pot. Add the sausage and cook until browned around the edges. Set aside. 2. 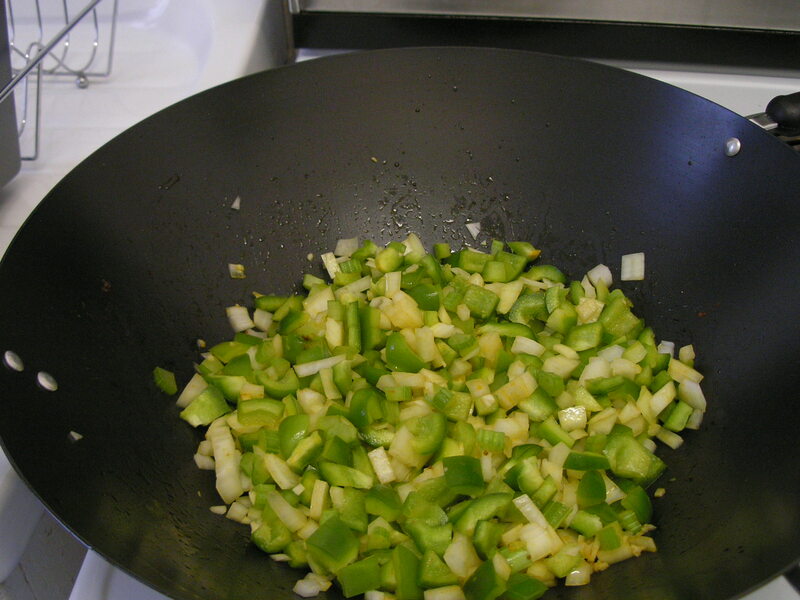 Add onion, bell pepper, celery and garlic to the pot. Cook over medium heat until soft. 3. Add rice, tomato paste and chili powder and stir for 1 minute. 4. Add boiling water, tomatoes and juice, salt, thyme and pepper. 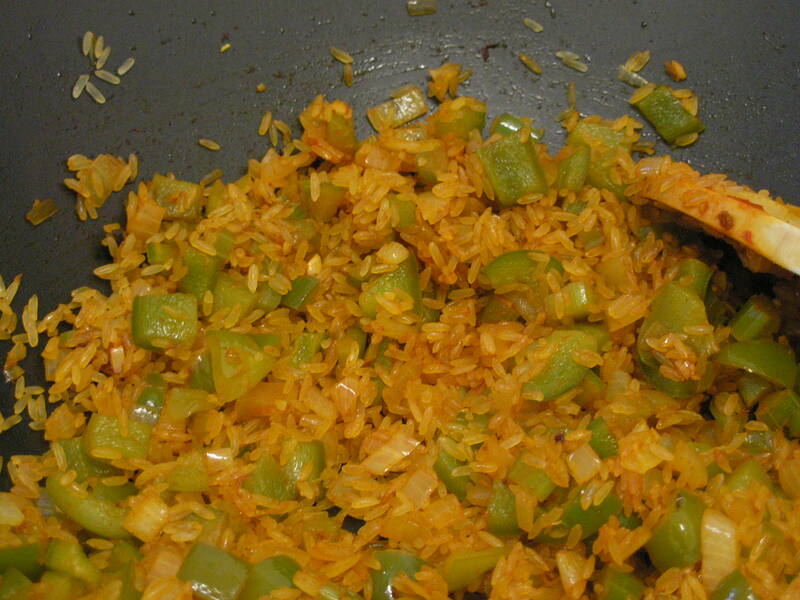 Reduce heat to low, cover and cook until rice is done. 12-15 minutes. 5. Add beans and cook until residual liquid evaporates and beans are heated through.